Palestinian youngsters train at a ground-breaking football club for girls in the West Bank village of Deir Jarir on September 13, 2017. 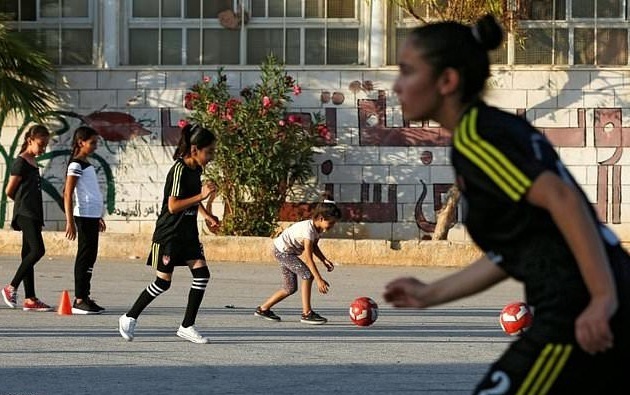 Dozens of young Palestinian girls are practising their footballing skills on a makeshift village pitch, enjoying an opportunity denied their mothers' generation in the socially conservative West Bank. Gender barriers and religious taboos mean that the sight of women wearing football kit, even girls, is still shocking to some Palestinians who regard it as a men's game. Yet women's football has developed significantly since the first Palestinian team was formed in 2009. There are now six adult teams playing in an outdoor league and a dozen more in an indoor league. Around 400 girls over the age of 14 are registered as players, and more and more younger girls are taking up the sport. The 40 or so girls between 10 and 14 training in the village of Deir Jarir, outside Ramallah, have to make do with just six balls between them and their shirts have the name of the boys' team on the back. But under the watchful eye of coach Rajaa Hamdan, they are learning how to trap and pass a ball, dribble between cones and jump for headers. 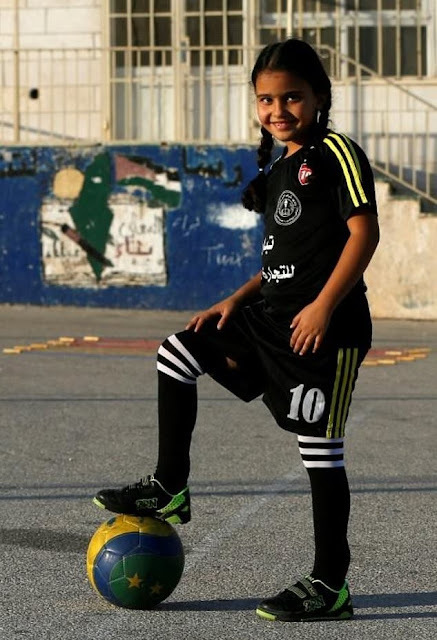 Hamdan said she had been desperate to play as a child but was prevented by social attitudes in the village. Now aged 32, she decided to set up a team for girls. "When I was young, the circumstances did not allow me to practise, but the idea stayed in my mind," she said. "So I said to myself as I didn't play when I was small, why doesn't my village have a team for girls like for the boys?" Using Facebook, she urged girls to sign up and was surprised to have 30 volunteers almost immediately. "I was afraid of problems with the villagers, but so far there have been no serious ones," she said. Salma Fares, 12, said she was proud to be part of the team. "I am very happy to practise football with girls like me. It is my right," she said. "I am happy they formed a team in the village for girls, like for the boys." Amal Alaa, 13, echoed her enthusiasm. "I love football a lot and when I saw the announcement of the team, I asked my parents to allow me to join. "My dream is to become captain." Hamdan said she was happy with the success of her project but worried the girls would give up on football as they grew older. "I am happy because I realised my dream of getting the girls out of the repression they face," she said. "In our culture and traditions, when girls get older they either wear a hijab or get married, so they will not play the game." The president of the village football club, Youssef Mousa, said he had been pleasantly surprised by villagers' reaction so far. "When the idea of setting up the team started, we were afraid of the subject because it was not easy to set up a girls' football team in a conservative village. "But so far there has been no problem."